Size: 721 sq.ft. - 1978 sq.ft. Emaar Beach Vista is the first development of residences launched over 10 million square foot Emaar Beachfront Township.Beach Vista residences are part of master community and were launched by Emaar Properties in January 2018. The apartments of Beach Vista will feature Miami-style interiors and large balconies. Beach Vista Residents having anuninterrupted access to a 1.5 kilometres beach. The towers are housing gym facilities, swimming pool, restaurants and parking. Emaar has recorded tremendous response from their buyers for selling out all residences of Tower 1. Beach Vista at Beachfront community is a twin-tower development that lies between JBR &The Palm Jumeirah. These towers will consist of 1 BR, 2 BR, 3 BR and 4 BR apartments overlooking the Arabian Gulf. The towers will stand on a six-level podiumand each floor will be containing 7 units. It is designed to ensure that all units will have a good view and every resident can take advantage of this. The one bedroom apartments will have views mostly of the Boulevard and Marina Skyline. The2, 3 and 4homes have the Palm Jumeirah view as well as views of the marina. The podium levels of Beach Vista Towers will have various amenities. Tower 1 stands 33 floors tall & Tower 2 is 26 floors high. * 1 BR homes- 745Sq.ft. * 4 BR apartments - 2,368 Sq.ft. * 2 Bedroom- 1,147 - 1,223 Square Feet. * 3 Bedroom - 1,967 - 1,978 Square Feet. Emaar is among the top ten property developers in Dubai. Emaar Properties is one of the world's most appreciated and an esteemed real estate development company. Emaar Properties isassociated with other high class projects in Dubai that includes Dubai Marina Mall Complex, Panorama at The Views, Travo, Al Murad Towers,Mosela, BurjKhalifa, Il Primo, Emaar Business Park Building 3, Address Boulevard, The Lofts, Boulevard Central,Zanzebeel 3, Miska 5, Reehan 8 and Creekside View.Emaar Group is known as the pioneers of master plan communities in Dubai. 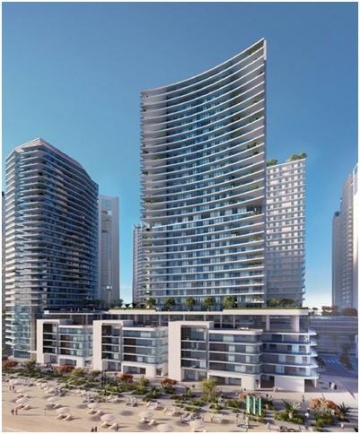 Apartments in Beach Vista will feature views of the crystal-blue waters of the Arabian Gulf. Relax in the Beach Vista swimming pool with wondrous views. Provide easy access to other major and sports facilities at Beachfront, Dubai Marina.The residents of Beach Vista have truly stumbled a wide array of resort-style amenities, recreational facilities, stylish restaurants and trendy cafes.Beachfront community will feature an advanced multi-modal transport infrastructure comprising an excellent road network in addition to air and sea connectivity. There is also a futuristic public transport system, jogging, water stations, pedestrian bridge and cycling tracks. Beach Vista lies between Jumeirah Beach Residences (JBR) and Palm Jumeirah at Dubai Marina, Dubai, UAE. Emmar Beach Vista is full of ultimate outdoor and indoor specificationslike finest restaurants, retail outlets, chic cafes,750 meters of sandy beach, a vibrant boulevard at their doorstep, wide array of gastronomic choices and urban entertainment,Concierge service, Doorman, Gymnasium, High-speed internet, Infinity Pool, Reception service, Residents lounge area, Retail area, Valet parking and many more features.